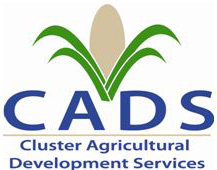 Cluster Agricultural Development Services (CADS) is a registered Zimbabwean NGO established in 2005. Areas of operation-Mashonaland East- (Goromonzi, Murewa, Mutoko, UMP, Seke & Mudzi) Manicaland- (Chimanimani,Makoni, Buhera, Mutasa & Mutare) Mashonaland Central-(Mazowe, Shamva, Muzarabani, Mt Darwin) Harare, Midlands- (Mhondoro Ngezi, Sanyati, Hurungwe, Gweru, Gokwe South, Shurugwi, Zvishavane and Binga. Food Security through sustainable agricultural technology development and dissemination Achieved through Participatory Research and Extension. Innovator farmers are involved in research, where technologies are tried, tested and disseminated. Dissemination of appropriate technologies such as improved horticultural production, production of small grains and techniques on soil and water conservation, soil fertility, natural pest management and appropriate crop varieties is spearheaded by model farmers and early adopters. Over the years farmers have experimented with over 100 technologies which now been compiled into a catalogue. Business development, Marketing, Nutrition and Value Addition CADS facilitates the development and dissemination of improved production and marketing systems, value addition technologies and processing for horticultural and dry land produce. Farmers process some of the dryland and horticultural crops they grow. Farmers have developed recipes which have been compiled into a recipe book which has been published. Seed production CADS facilitates the development of programs on seed production, multiplication, distribution, retention and marketing to ensure access to seed by vulnerable members of the community thereby achieving seed and food security. Farmers have managed to produce and multiply seed for crops such as black-eyed beans; cowpeas, groundnuts, sorghum and open pollinated maize varieties. These have been distributed among farming communities at affordable prices as compared to private market outlets. Vibrant farmer organizations in terms of ability to address key socio-economic and organizational capacity challenges that impair smallholder productivity and sustainable livelihoods. Facilitation of institutional strengthening, technology development, marketing and distribution of agricultural products. Integration of HIV and AIDS and gender in sustainable agriculture and working in collaboration with other relevant service providers to support Community Based Organizations (CBOs) formed and run by smallholder farmers. The disadvantaged and Vulnerable Orphans and Children, widows, widowers and those infected and/or affected by HIV and AIDS.